The first step is to make a biga, which is basically a sourdough starter. I made the biga on Saturday, and only let it bubble overnight, rather than a couple of days, so it likely didn’t get super flavourful, but it seemed to be bubbly and active enough. 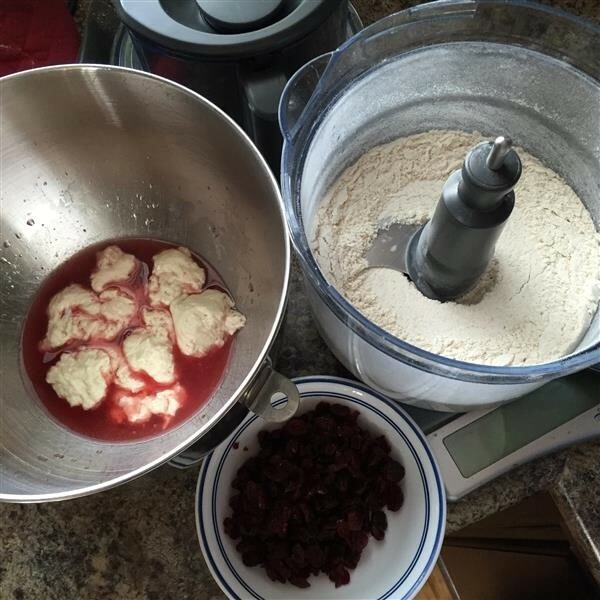 The biga gets torn or cut into small pieces and put into the water from soaking the cranberries. Toast walnut pieces, and pulverize them with some whole wheat flour. Mine was ground fresh. 🙂 Add the rest of the dry ingredients and mix that up. Add the flour to the water & biga mixture, knead it into a rough dough, then let it rest for 20 minutes. This is a perfect time to go deal with laundry. Or wrapping Christmas presents, or any other small job on your to-do list. This is why I like bread. Next knead in the rest of the walnuts, then the cranberries. Let it rise for a couple of hours. A great time to go weave. 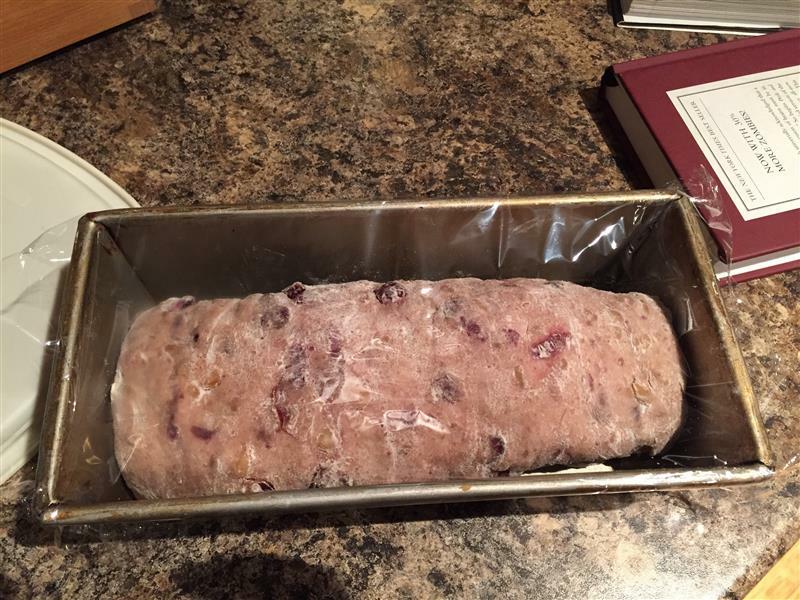 Take the dough out, flatten it into a rectangle, and fold it in on itself, then let it rise for another hour. A good time to go watch an episode of Gilmore Girls on Netflix. Then take the dough out and shape it. This is “supposed” to be a torpedo shaped loaf, but I really like my bread in nice neat loaf shapes. So, that’s what I did. Now’s a good time to go read a bit more about Lizzy Bennet, Mr. Darcy, and the plague of unmentionables (a friend lent me “Pride and Prejudice and Zombies” a few weeks ago, and I’m mildly ashamed to admit to quite enjoying it). Just before supper, I slashed the bread and put it in the oven. All in all, this is an easy recipe. Not quick – yeast breads seldom are – but it’s one of those things that easily slots into just about anything else I’ve got happening on any given weekend. It’s so satisfying, too. A dear friend’s mother passed away the week before last, and I called my Mom and asked what I should do. Mom’s suggestion: take her a loaf of bread. Nancy’s the one that introduced me to the satisfaction of grinding my own flour, and Mom was absolutely right. We brought her some bread last weekend, and we were invited to stay for lunch – sandwiches from my bread, with fillings Nancy’s daughter had prepared, and pumpkin soup. I hope our visit was the right sort of distraction. It definitely felt right. 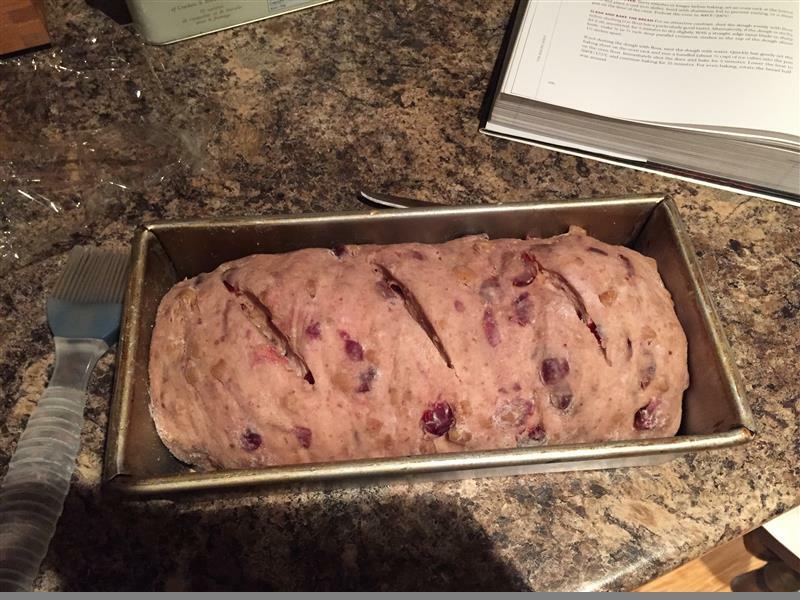 Posted on December 21, 2015 December 21, 2015 by KristinaPosted in The Baking BibleTagged bread, cranberry, walnut. Beautiful loaf of bread! What an enjoyable post. So cute reading about your day and how bread baking waltzes through it. I’m with your mom, that was a wonderful idea taking your friend a fresh baked loaf of bread baked with love. Those are the things that mean the most during times like that.